How I managed, through gross underestimation of the objective, to make what I thought was going to be easy rock outing turn into something more memorable. 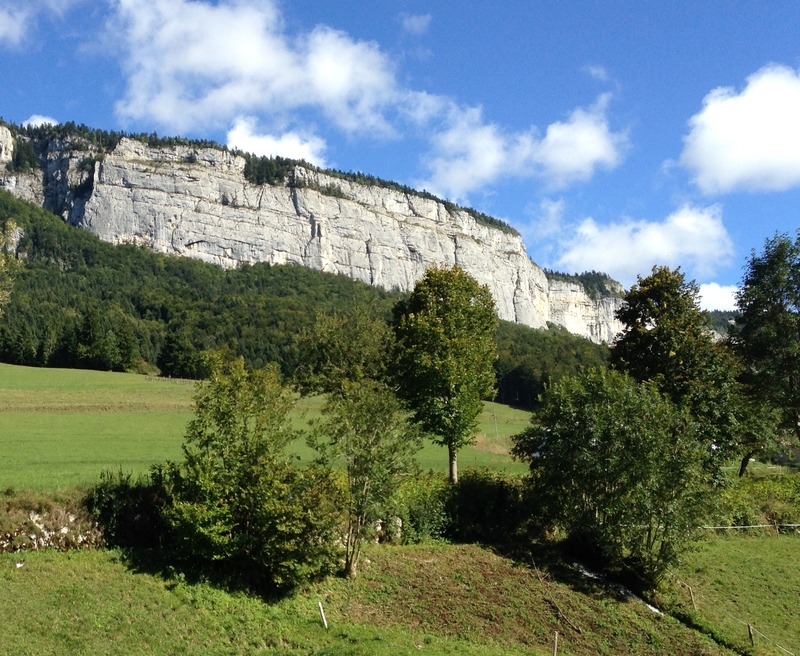 We’ve been spending most our time in the Vercors cycling. This has been fantastic; quiet roads, good climbs and beautiful scenery. However, this day was cycling free for me. 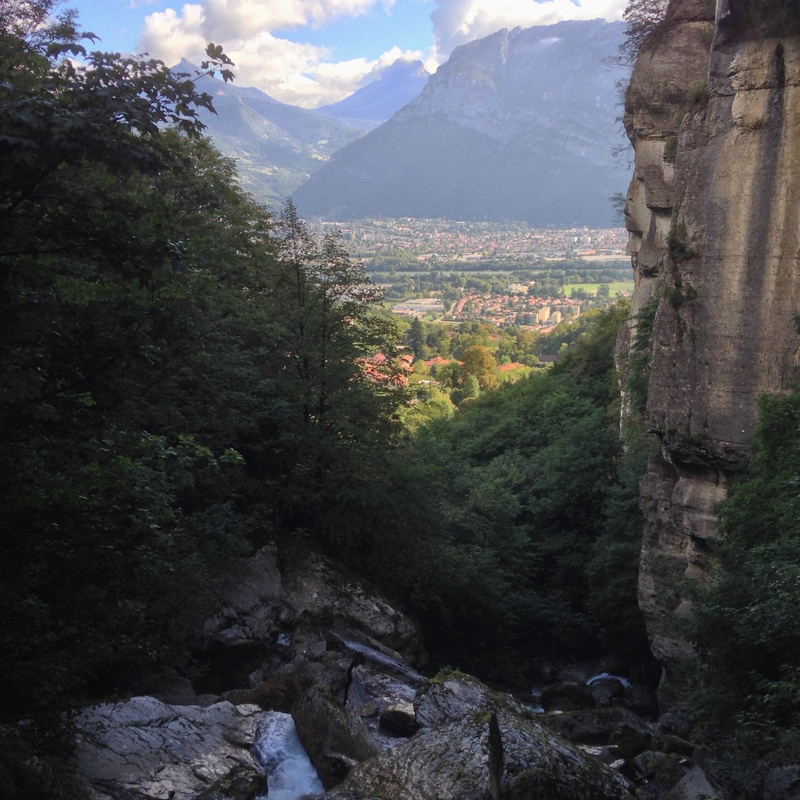 In the morning I met a friend who lives in Grenoble and we went for a walk up the Gorges du Furon, which is above the pretty village of Sassenage. The walking path through the gorge left the river so we picked our way up the gorge where there was a faint trail. 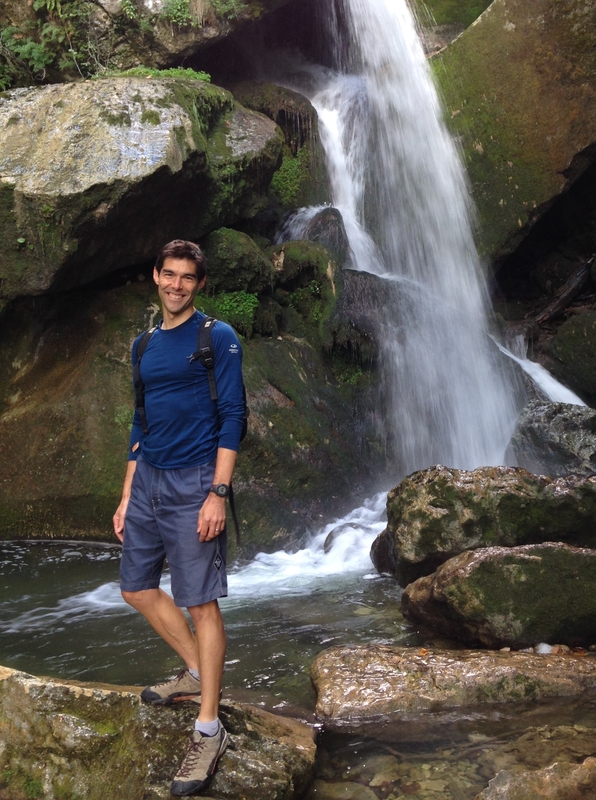 It involved a bit of scrambling and it was fun to be exploring as neither of us knew where to go. At the top we had a great view down the gorge to Grenoble. It took about an hour to get to the top. In the summer it is a great place to swim although it is quite crowded; however we were the only people there that morning. 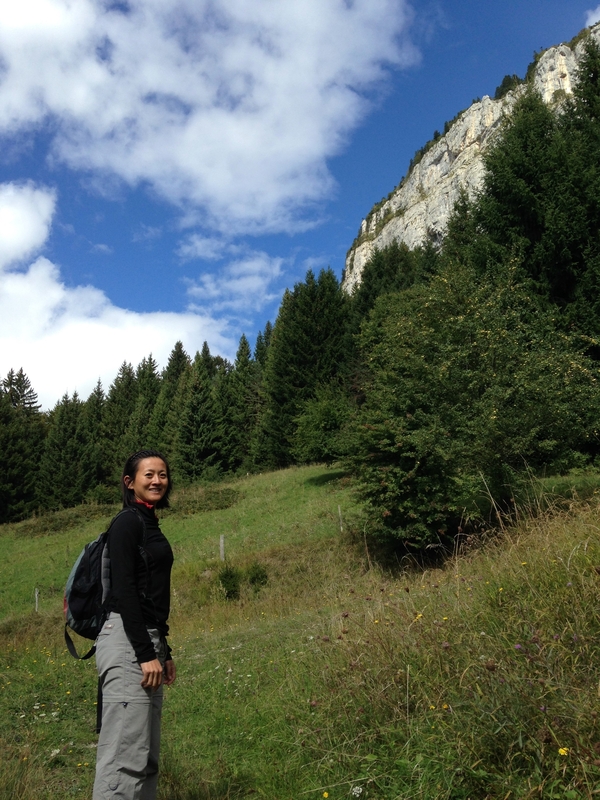 After lunch, I picked up Lillian (who had spent the morning cycling) and we headed off to do an equipped climb, called the Via Corda, to the top of a large cliff we had run to the top of a couple of days previously. The Via Corda climbs the cliff on the left, starting in middle and taking a leftwards rising traverse. At about 2.45 we set off from our car to walk up to the start of climb. The climb is equipped with iron rungs so is not really a rock climb. 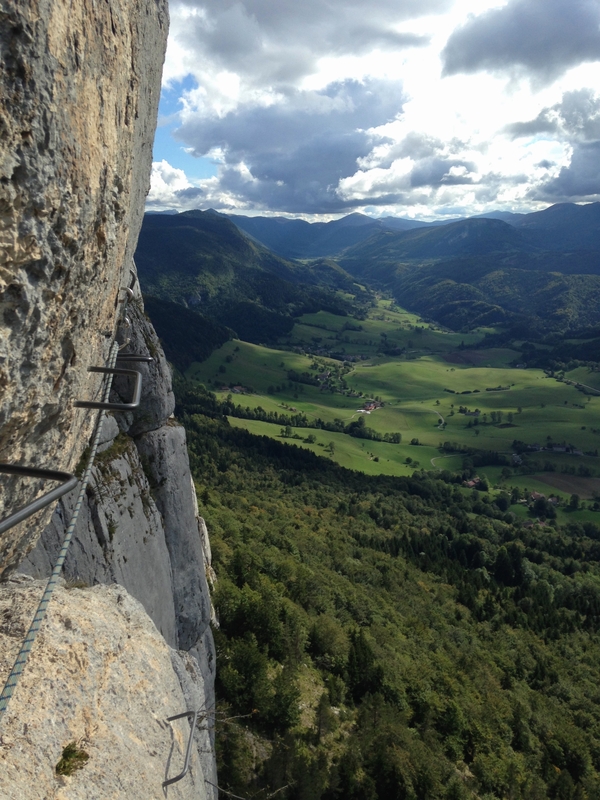 It’s more of a via ferrata with pre-placed bolts and karabiners. I had read on the internet that is was French 3b which is pretty easy (for example at the climbing wall the children’s climbs are about that grade). Further, the recommended time was 2 to 4 hours, so I thought that we should be able to race up it in 2 hours. We got to the bottom and thought it looked quite steep. As we planned to move together and our 60m rope was only 8.5mm in diameter I doubled it up. However, after climbing the first 30m, I felt it would make sense to belay Lillian up the first pitch. The bit above looked tricky too so I did a pitch up that. And above that it was overhanging slightly so I did a third pitch. A few metres from an obvious belay Lillian said that I was nearly out of rope. I managed to just get to a bolt/cable (but not the main belay and rappel point), clipped in and brought her up. I was now wondering if continuing was such a good idea as I remembered that the route did a long traverse followed by more up, then the same again two more times. 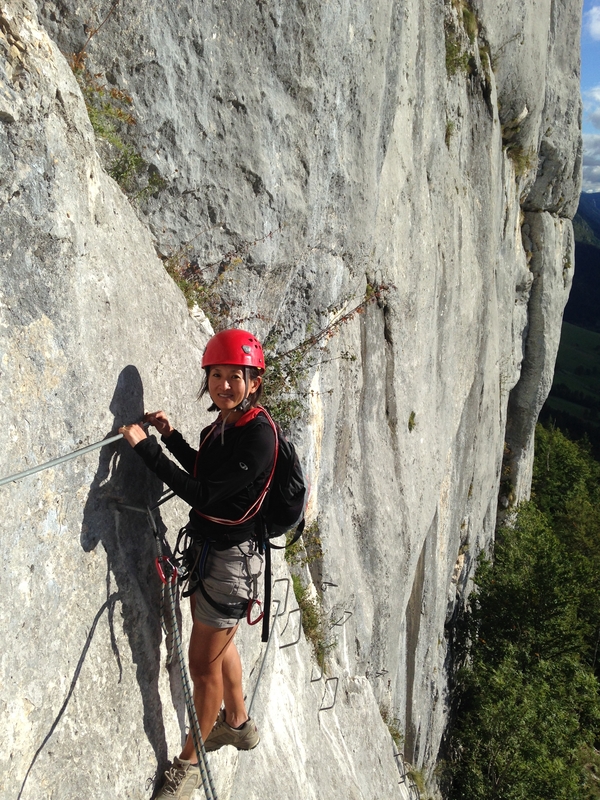 After the traverse, an abseil retreat would not be possible. I had a look around the corner and was hit with a blast of cold northerly wind that we had been sheltered from until then. It was also somewhat exposed, as shown in the photo below looking back to where Lillian was belayed. 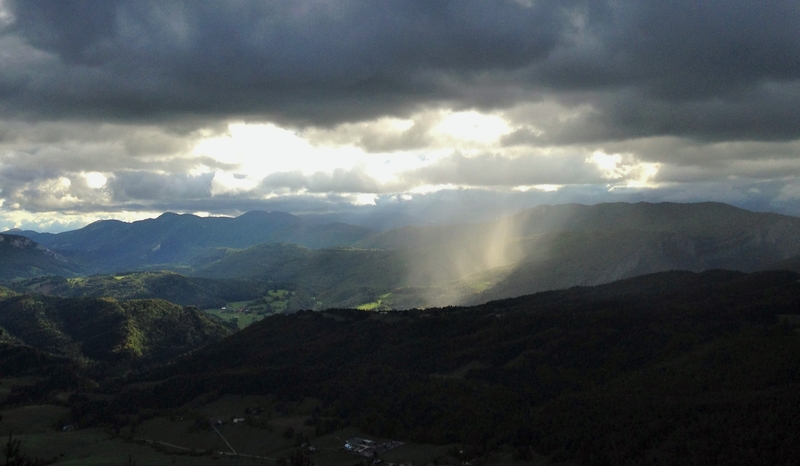 As it was now 4.30 and the weather was also looking a little worrying, with some rain on the other side of the valley, we decided to retreat. The only problem was I wasn’t sure if there would be enough rope to lower Lillian from the rappel point on the doubled ropes, so we decided that I would belay her on a single rope and she would down-climb. She did this without any fuss, although it was a little scary, and then I rappelled down to join her. We down-climbed the second pitch and then I lowered her to the ground before rappelling down to join her. Just as we got down, which was at about 5.45, a British guy who lived and worked in Grenoble turned up with his partner. He was a little perplexed with what we were up to, doing a full scale retreat of something that is basically a well protected easy climb. He then proceeded to head off up it at around 6pm saying he expected that he would finish in the dark. As he’d done it before it didn’t seem entirely foolhardy. 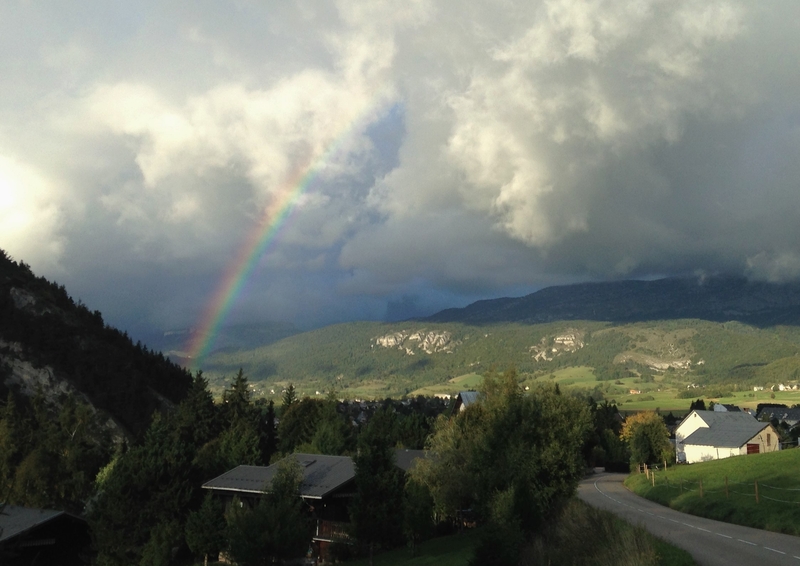 That said, it started rained as we were driving home; though that gave us a great view of a rainbow over Villard-de-Lans. So, what did we learn from that experience? Firstly we should have believed the ‘guidebook’ time and started earlier. In fact it would have been good to have had a copy of the route as we would have then known for certain how far up it we were. Secondly, 3b doesn’t feel quite so easy when you have 100m of nothing beneath your feet. 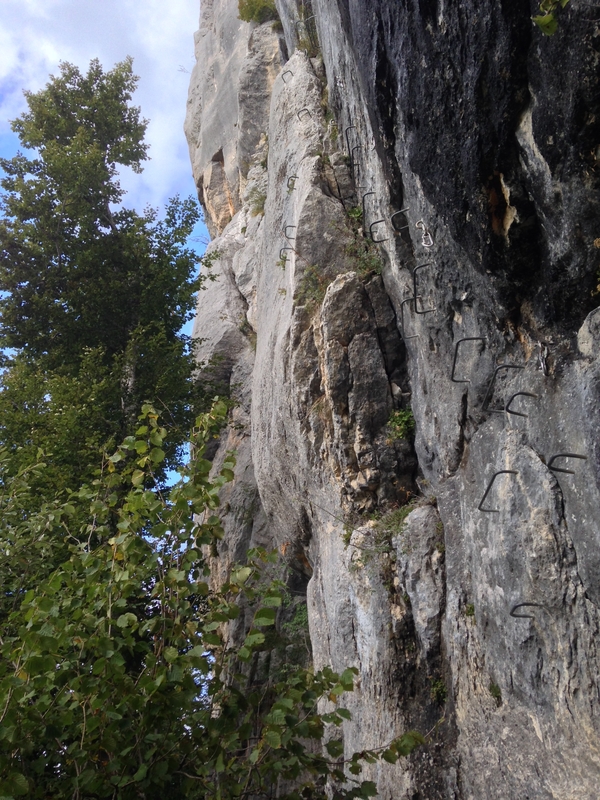 Essentially it was a multi-pitch climb which just happened to be covered with large metal hand-holds. Thirdly, we should have brought some via ferrata gear so we could have been able to move together confidently. We only actually made it about a fifth of the distance up the climb, so pitching it the whole way was clearly not an option. Also if we were going to pitch the steep bits we should have had at least 40m of rope between us. Finally, I learnt something too; that when Lillian says that I am trying to fit too much into the day, she is usually right! It’s easy to forget with via corda that whilst the climbing is easy the situation can be quite serious.